Three long years had gone by since I had hit the Bulawayo tarmac in 2014 and first visited Rosslyn Safaris. Dad and I left Mauritius in a hurry after my taxi coming back from a night out had taken ages. Once settled in our seats we cracked open a drink to commemorate the start of our father and son trip… just before meeting mum at the Joburg airport 4 hours later. I don’t seem to be able to shake it, every time I land in Zimbabwe, this feeling of seeing my grandpa ‘’Moune” watching us from the arrivals lounge upstairs with his hands in his back. Nothing better in this world than hugging him after a while apart. It was a beautiful afternoon in Harare and I couldn’t wait to see all my younger cousins. A short night…and here we were. Bulawayo airport. I can’t seem to understand why I find the Bulawayo airport much more attractive than the Harare one; guess it should have been the other way round but anyway. Juliet was here to welcome us as we hoped in her Honda, popped to town to grab drinks and off we were to the long awaited Cawston Block of Rosslyn Safaris. The traditional Bushbucks were on time to welcome us at the lodge, which to my greatest joy, hadn’t changed at all since last time I was here in 2014. 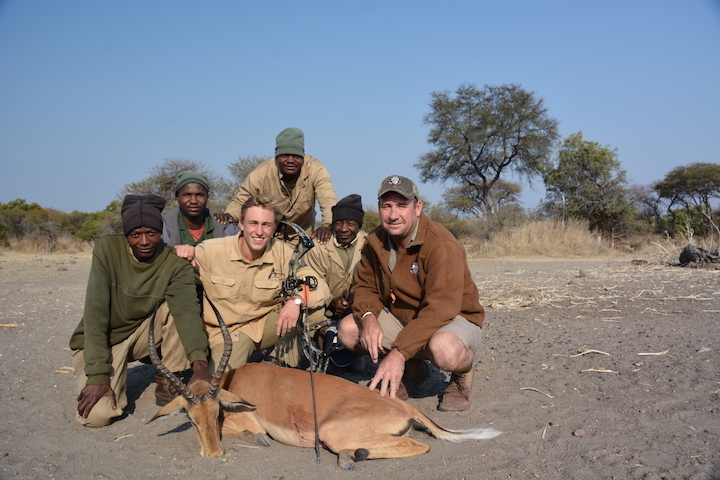 I quickly swapped blue jeans to khaki shorts, squeezed in my hunting boots and joined Moune, already on the deck with his ‘binos’ scouting the impala herd at the water hole. Big Charles and Little Charles, the cooks, treated us to a delicious Giraffe lasagne lunch before taking off with the camp apprentice Chris, who knows every single corner of the ranch like his pocket. Dad and I had a lot of fun adjusting the rifles and shooting the 10-round capacity 12 gauge. I shot two Francolins (recently renamed as Spurfowls) on the way back to camp… these would end up making great pre-dinner snacks during the week. I was very happy to be welcomed at dinner by the great Clive Hallamore, who made my 2014 hunt so special that there was no question of thinking about another PH for the 2017 edition. 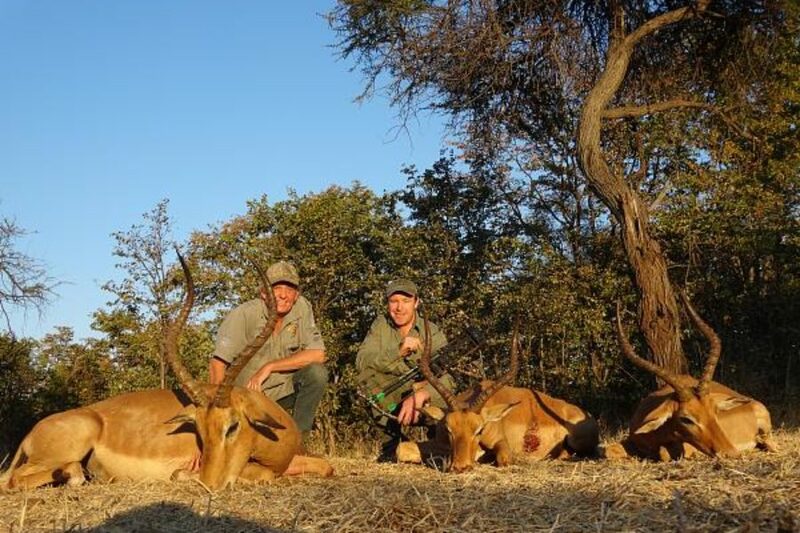 Clive was finishing a hunt with two great guys from America, Bob & Lou from California, who just had a tremendous two weeks shooting sable, eland, kudu, bushbuck, warthog and many others. 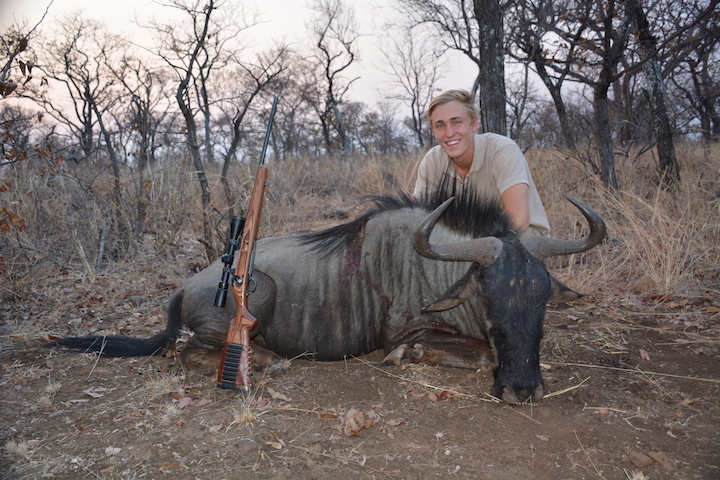 We took off early the next morning to look for a non-trophy warthog for Dad. 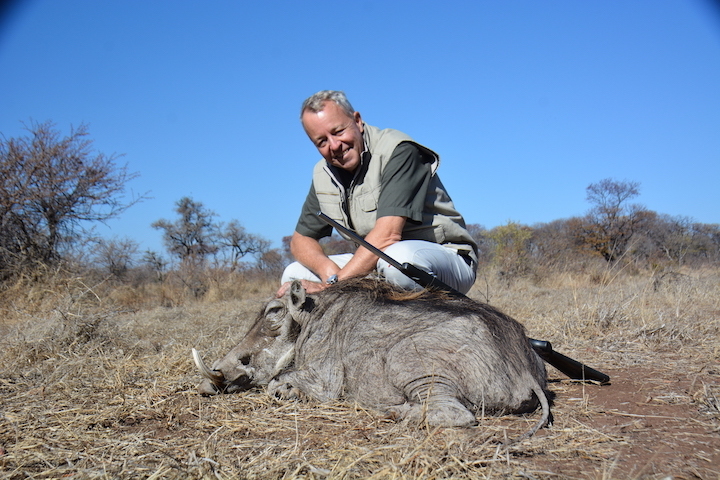 Chris led the way and after 2 hours of walking and stalking we approached a warthog to about 30 metres and Chris and I looked at each other thinking this might be the one. The pig turned around and Dad was on the sticks. 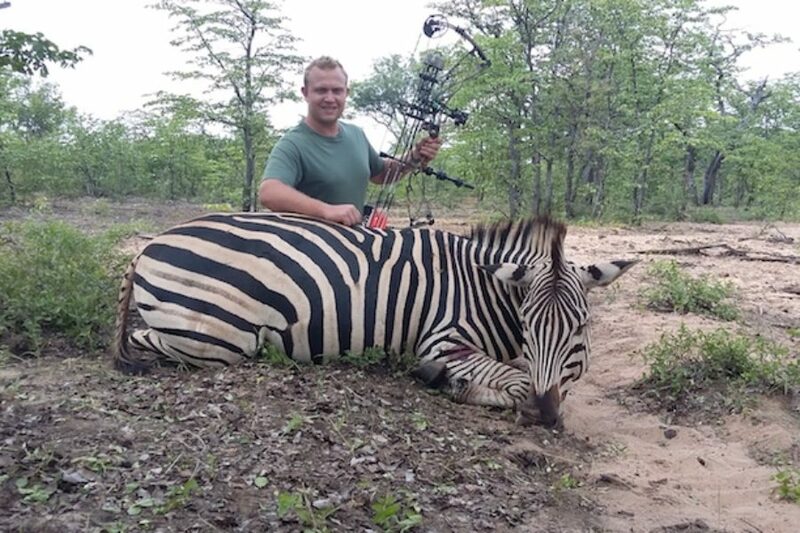 BOOM, and the pig took off just to sit down a few yards away before my dad finished him. 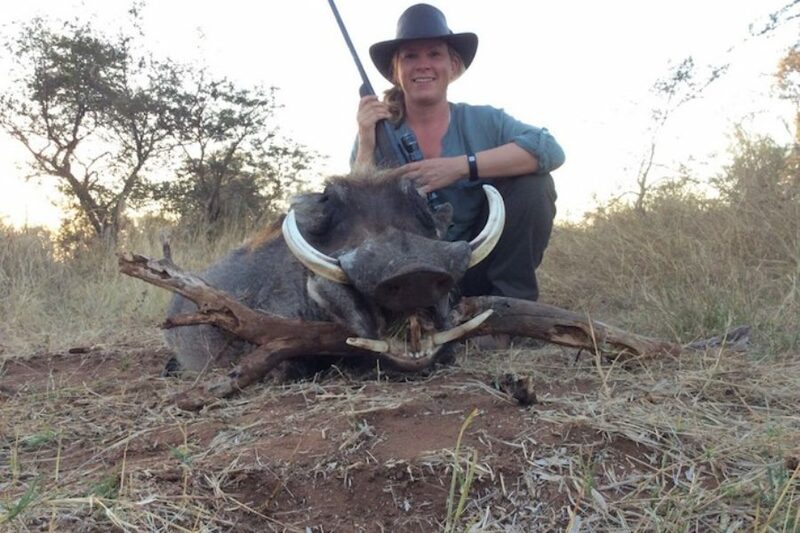 What a start, a nice old pig with worn out and broken tusks. I remember thinking ‘’game on’’, shot a couple more before waking Moune and my dad up explaining that they wouldn’t be walking but just sitting in the blind with me, and off we went. When we got to the blind, I thought: ‘’how am I going to react when something shows up?’’ as the only other time I had shot a compound was at a friend’s house on a target. 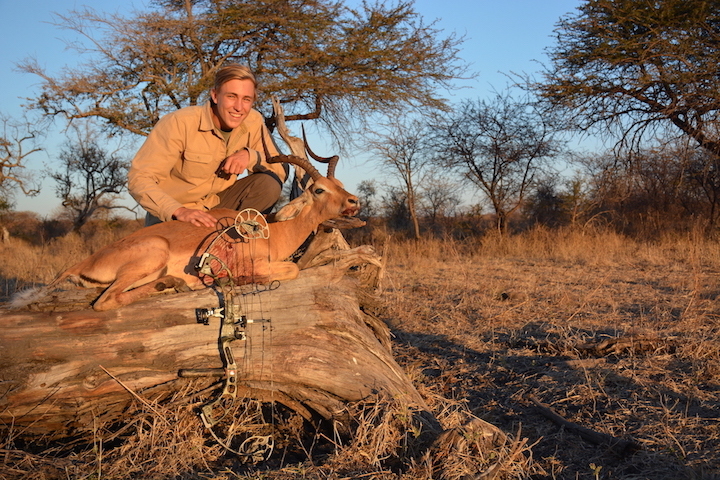 I didn’t even have the time to think about it when a good-looking impala ram showed up at around seven yards. I drew the bow, placed the first sight on his shoulder and click! A clean pass through shot followed by some words I would not write here to explain the thrill I had just experienced. My word, what a feeling. I remember just seeing the shot over and over again as I tried to catch my breath. Dad found the impala 100 yards away and we were blessed with a magical sunset after taking some photos. We were finally joined by the pro and his pack the next day and for the rest of the week. Clive had brought the same guys as in 2014 and it was a blessing seeing them again. 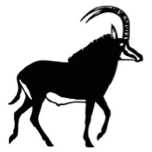 We headed off to find a very special Kudu they had on the ranch, which boasted a Dall sheep-like curly horn, that I really wanted to have a go at. 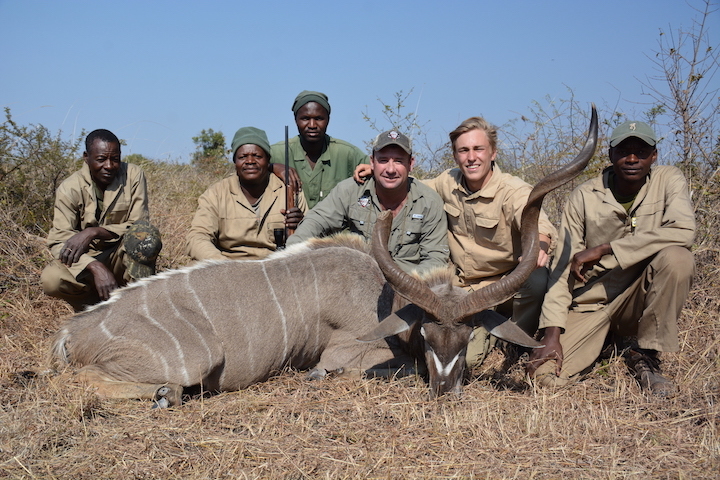 After a full day scouting every corner of the ranch we decided to go for the first peculiar-horned Kudu we would come across. The rest of the week was a non-stop marathon, with countless hours of walk and stalk and Moune never ever backing down. 79 years of age but the passion and the brains of a 21-year-old. Role model. 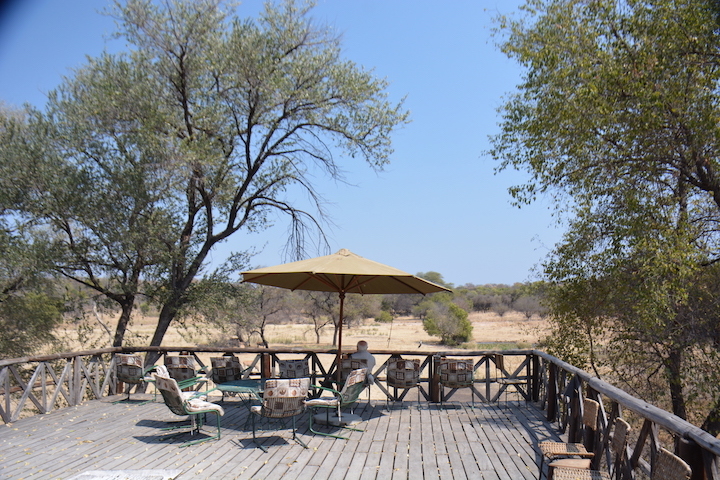 We went back to the blind at number 5 water hole to wait for a pig. 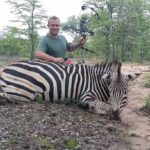 Classic full-on amateur mistake occurred when a stumped tusk warthog showed up at 12 yards and I shot an arrow without even looking in the bl**dy string ring, passing 5 inches on top of his spine. Mum joined us from Harare for the last two nights. So good to see her back in the bush that she loves so much. 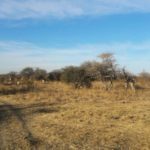 Dad managed to get a good shot at an impala on the second to last day while mum and I stayed near the Cruiser overlooking the approach. 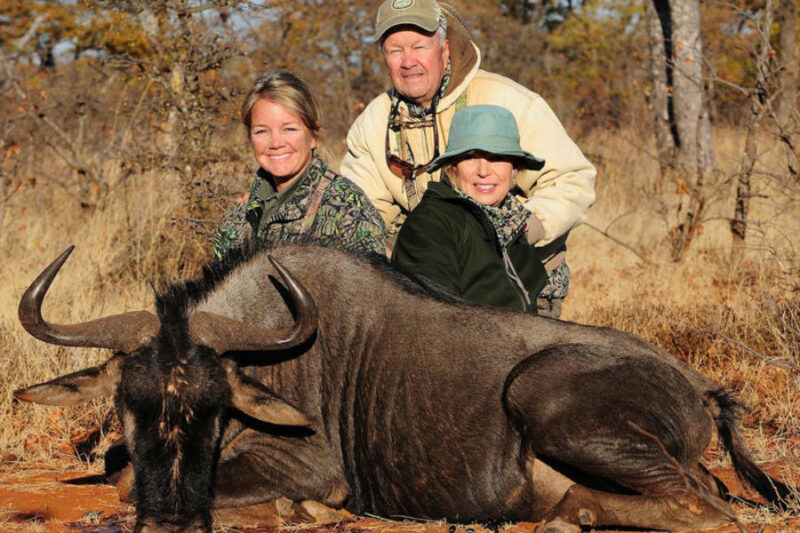 I was very happy to have Mum on my side while approaching a wildebeest bull with Clive the next day, a very old specimen in charge of a herd of 20 cows. Once again, the 308 did its job as the day was coming to an end. 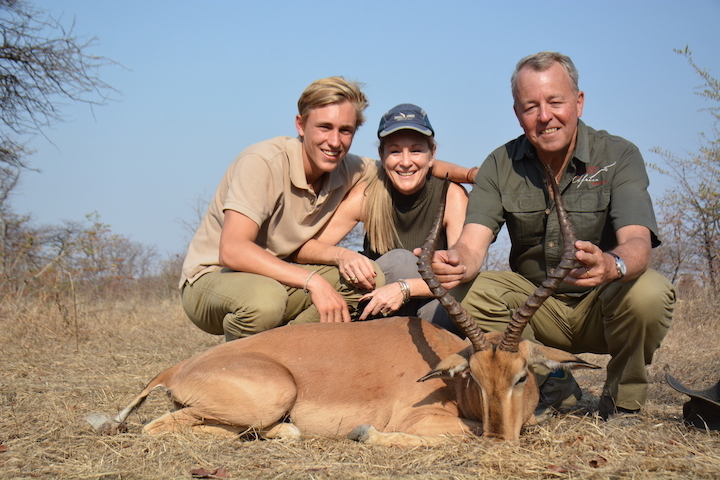 Juliet, thank you so much for putting your trust in me, allowing me to go bow hunting with the little experience I had and making this 2017 edition so memorable, I will never forget it and I cannot wait to be back hunting on Rosslyn Safaris. Clive, I’ve already told you everything but in case you stumble across these words, thank you. Thank you for your professionalism and for making this hunt pitch perfect, but more importantly thank you for all your advices, the life lessons you taught me and for being the genuine man you are.